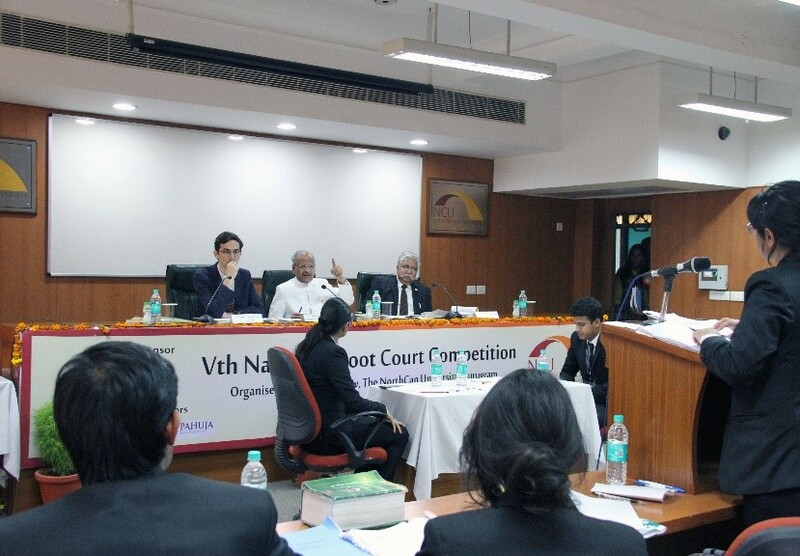 The School of Law (SOL) organised its Vth NCU National Moot Court Competition (NMCC) from 14-15 April 2018. It is one of the rare competitions in India which is being held on a pressing issue of environmental law with changing theme every year for which it has also been conferred the title of “Indian Stetson”. The event was inaugurated by Hon’ble Mr Justice Rajesh Kumar Agarwal, Judge, Supreme Court of India, Mr SB Mitra, Executive Director (Law & HR), GAIL (India) Ltd, Prof. Pushpesh Pant (Professor Emeritus) NCU. 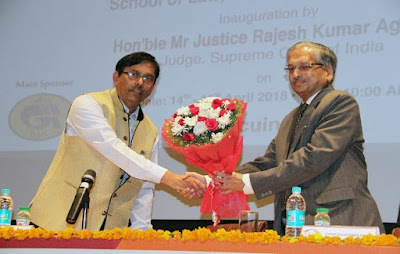 Justice Agarwal appreciated the efforts of SOL for highlighting such a critical and important issue of present day relevance, namely the Shale Gas as an alternative source of energy. 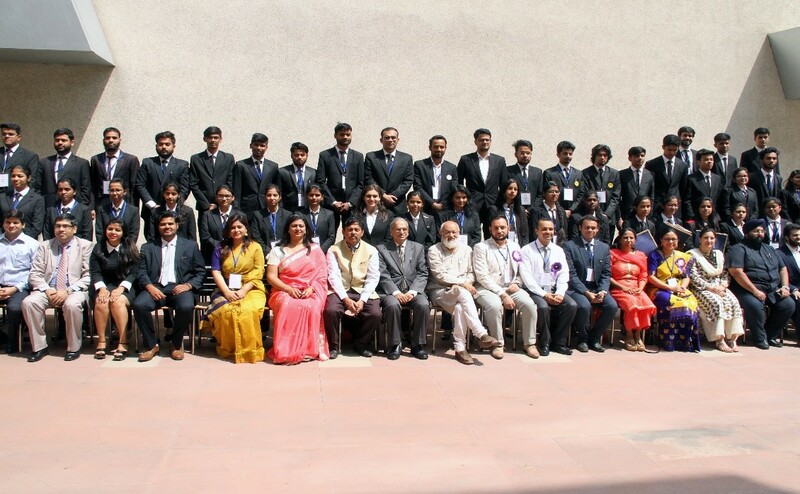 The Moot Court Competition witnessed participation from Central and State Universities, National and Private Law Schools from all across the country. SOL NCU has carved a niche for itself, as a leader in Environment Law Moot Court Competition. The Moot Proposition for the Vth Edition highlighted the contemporary issues related to exploration and production of Shale Gas, with special emphasis on unavailability of land, displacement of local communities and mineral rights and ownership. The moot proposition was closely related to use of Shale Gas as an energy resource and the problems that are a part of production and consumption of Shale Gas. The moot court competition vexed to tackle the big picture question that whether it is necessary to have development to feed the energy needs at the price of creating a water problem. 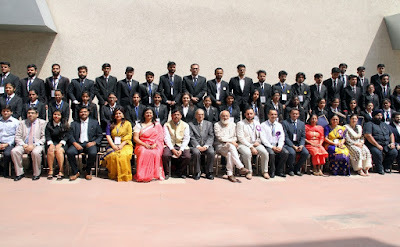 Eminent dignitaries from the legal domain, Supreme Court lawyers, corporate officers and academicians were invited to judge the various rounds that took place over the two days. Out of the 20 teams, eight teams qualified for the quarter-finals on the first day of the Competition, and four teams qualified for the semi-final round and battled on the second day to reach the finals. The Final Round of the Competition was chaired by a bench comprising of Hon’ble Justice M Karpaga Vinayagam, Former Chief Justice, Jharkhand High Court, Prof. Dr Paramjit S Jaswal, Vice-Chancellor, Rajiv Gandhi National University of Law and Prof. Anatole Boute, Associate Professor, Chinese University of Hong Kong, specialising in Energy, Environment and Investment Law. The final round witnessed exhaustive and enlightening questioning by the Bench. They asked several questions pertaining to challenges of Shale Gas fracking process and Centre-State relationship with respect to mineral ownership. The competing teams answered the questions in a commendable manner. The students received a lot of appreciation and sound advice from the judges regarding how to answer the questions in a Court of Law. 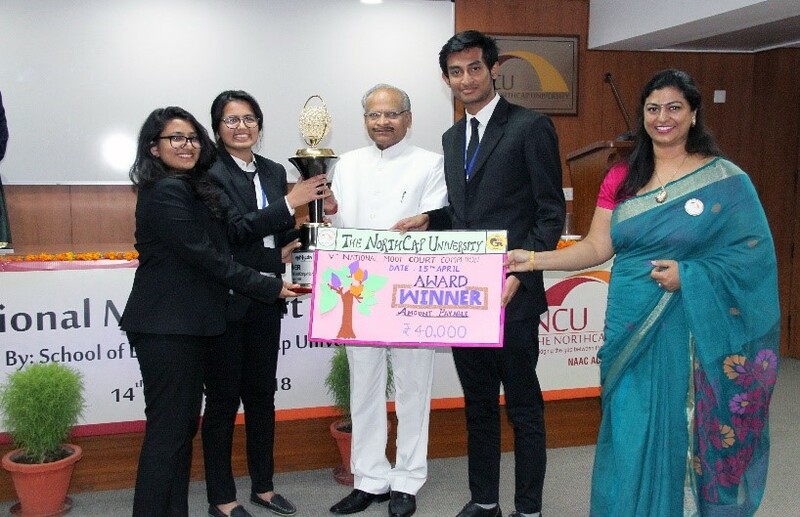 NUSRL, Ranchi emerged as the Winner of the competition and awarded a trophy, certificate and a cash prize of Rs 40,000 and SASTRA University, Chennai were the Runners-up and awarded a cash prize of Rs 20,000. Award for the Best Memorial of Rs 10,000 was bagged by RGNUL, Patiala; Award for Best Female Advocate of Rs 10,000 was won by Aiman Hashmi, Law Centre-I, University of Delhi and Award for Best Male Advocate of Rs 10,000 was won by Mayank Jain, School of Law, Ansal University. 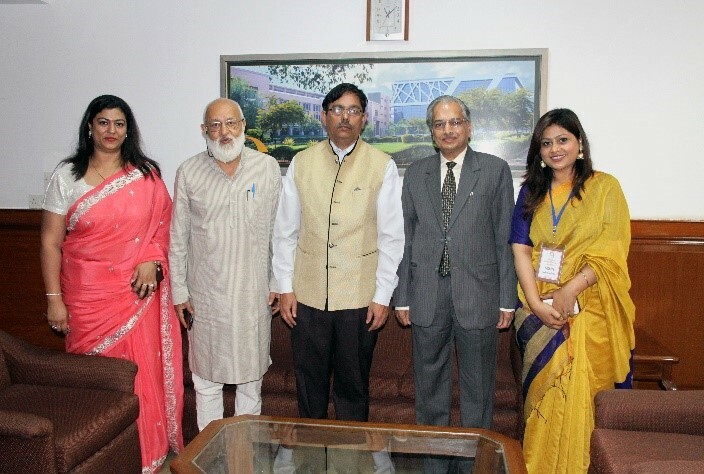 Quoting Sir Albert Einstein – “Try not to become a man of only success, rather to become a man of value”- this lesson of values and ethics is what the School of Law, The North Cap University strives to bring across to its students. Similar lessons have always been brought up in the series of Environmental Law Moot Competitions, conducted by the School of Law and it continues to look forward to hosting further series of enlightening events and also to come up with the VIth Edition of National Moot Court Competition with another important and concerning topic.